Where can I find more songs? The built-in Windows synth is slow and doesn't sound great. How can I make the songs I create compatible with Synthesia? Can I use my unlock key with Synthesia for iPad? Can you give a brief history of the project? Synthesia is a game that can help you learn how to play the piano using falling notes. Synthesia lowers the barrier to entry for beginners. You can get started immediately without knowing how to read sheet music. Playing songs right away provides great motivation to stick with the piano where you can learn traditional sheet music notation over time as you go along, should you choose to. Synthesia is also great for more experienced players. It's a nice platform for quickly sight-reading a new piece, and nearly any song can be found in the MIDI format that Synthesia understands. Synthesia is also a nice companion tool for daily practice to complement piano lessons. The scoring and progression systems help keep track of personal growth on each piece. Watch the notes fall and follow along. Or, connect a piano and join in the fun. Synthesia shows any MIDI song as falling notes or sheet music so you can follow along easily. 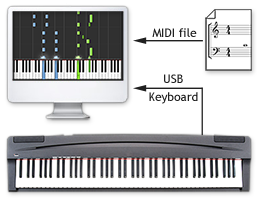 If you connect a musical keyboard (using USB or MIDI), Synthesia listens to your playing and helps you learn any song. Don't have a digital piano? Check out some that we recommend. Check out the Synthesia Music Store for the highest quality MIDI songs. Finding high-quality songs in MIDI format can be really challenging. So we decided to help solve the problem by creating full MIDI arrangements of your favorite songs. Our goal is to give you the highest quality MIDI version of each song, at a super reasonable price. All songs are fully licensed by the original publisher for digital download. New songs are added often, so be sure to check back regularly! The only requirement is graphics hardware that supports the OpenGL 2.0 standard (released in 2004). Original iPad 1 users can still download an older version of Synthesia by following these instructions. Synthesia is best experienced on a tablet-sized device. Google maintains a list of Chromebooks that can install Android apps from Google Play. Be sure to update your Chromebook to ChromeOS 65 or later to get support for connecting MIDI devices via USB. Switch to the built-in synth included in Synthesia 10.5 or later. First, if your keyboard has an on-board synth, that's usually the best answer. Keyboard synths are always the fastest and usually sound very nice. Otherwise, Synthesia 10.5 and later includes its own MIDI synth that is much faster than the old Windows synth (and less buggy than the new Windows synth). The included sounds are higher quality, too. If you like, you can even use your own SoundFont! Just place the SF2 file anywhere Synthesia already scans for songs and it should appear in the list when you head over to Settings → Music Output → Built-in MIDI Synthesizer. See the Changing Instrument Sounds guide for step-by-step instructions. Every MIDI song is compatible, but there are a few guidelines to make them even better. In general, Synthesia works with any MIDI file. Though, whether you're putting together lessons for students or you want to share a song you wrote with other Synthesia users, there are a few easy steps you can follow to get the most out of Synthesia's extended features. Here is a short guide on how to Create Great Content for Synthesia. Synthesia for iPad must be unlocked separately. This is an unfortunate consequence of Apple's policies. If something is unlockable for a price, Apple requires payment must go through the App Store exclusively. Unlocking the app with something purchased at the Synthesia website would break that rule. Going in the other direction, another of Apple's rules describes that if something can be used outside the app, it must not be purchased through the App Store. So, that means we can't allow iPad in-app purchases to be used with the other versions of Synthesia. To make a bad situation a little better, we've lowered the price of Synthesia for iPad to less than half the desktop version's price. Synthesia continues to evolve into the best practice tool for beginners and experienced players alike. The project is introduced as "Piano Hero". It doesn't support musical keyboards yet and the site runs on donations. Requests for a Mac version prompt a donation drive to help us get Mac development hardware. A couple of articles help accomplish the goal on the first day! Activision requests the name be changed to avoid confusion with Guitar Hero. A name contest is held. The name "Synthesia" wins. The Mac version is released and the project is renamed to Synthesia at the same time. Persistent requests for a sheet music view prompt the creation of the Learning Pack: a paid upgrade that will include educational features and grow over time. Learning Pack sales replace the donation-based model. Synthesia continues to grow rapidly and add new features to both the free download and Learning Pack. In addition to regular releases, Synthesia is featured on the UK television show Strictly Come Dancing. Synthesia becomes the most popular way to produce piano tutorial videos online. Features are added to help educators use Synthesia as a teaching platform and create content more easily. Synthesia makes its debut on the iPad. Synthesia goes international! Six display languages are added including Spanish, French, German, Russian, Brazilian Portuguese, and Traditional Chinese. The Music Store launches, providing the highest quality MIDI versions of popular songs anywhere. Custom hand assignments, dozens of major improvements, and new languages make for the largest update Synthesia has seen to date. Synthesia is released for Android tablets, which means it's now available in more places than it's not. A series of How-to Guides are added to help users discover all of Synthesia's powerful features. More than 50 convenience improvements and fixes are added to make Synthesia friendlier and easier to use than ever. Synthesia continues to support new technologies like Windows 10 Bluetooth MIDI and the key lights on The ONE Smart Keyboard. Synthesia expands its platform support to compatible Chromebooks, making it much more widely available in classrooms around the world.